Rethink Everything! is the title of the last chapter in my upcoming book Grow a Sustainable Diet: Planning and Growing to Feed Ourselves and the Earth. The official release date is March 1, 2014, but I should have copies for some events I’ll be at in February. You can check my website for those dates and locations. When we are growing up, we are pretty much brainwashed by our parents to live according to their beliefs and habits. That’s just how it is. Then we do the same with our children. But, now that you are grown, you are free to decide for yourself. If you are still blaming your parents for how they raised you– shame on you. It’s your life; get on with it. I want to encourage you to rethink everything you do and look at things with a holistic approach. Don’t be afraid to decide that some of the activities you have been active in are not so important in your life anymore. We should clean out our social/activity life regularly, just as we should clean out our closets on a regular basis. I’m working on a new book. This one is about seed libraries. If any of you are involved in a seed library, I’d love to hear about it. While researching that topic, I came across the website for the Center for the New American Dream where I found a webinar about starting a seed library. The new American dream that this website is referring to is about more of what matters, not more stuff. It is about developing a plentitude economy; one which has reduced work time, allowing more time for do-it-yourself projects at home and more commitment to community. I have a feeling you are already participating in this type of an economy that will contribute to a better society. Having a garden, preserving your own food, supporting a farmers market, and developing your homestead, whether it is in an apartment or in the wide open spaces, are all part of the New American Dream. Decide what your dream is while you are rethinking everything. Christmas is a great time to rethink everything. A holistic approach would bring your holiday actions more in sync with the other ecological things you do all year. One thing, if you haven’t already done it yet, is to get rid of Christmas wrapping paper. It is easy to pull out the Sunday funnies to wrap an occasional birthday present, but when faced with wrapping more presents at one time, it took us a little longer to ditch the Christmas wrap. When we did that a number of years ago, it made an enjoyable difference. That first year I had found some Christmas fabric on sale at a deep discount and bought a few pieces to make gift bags. Not all the bags have to be Christmas fabric. Some are solids or prints that could also suit for birthdays. 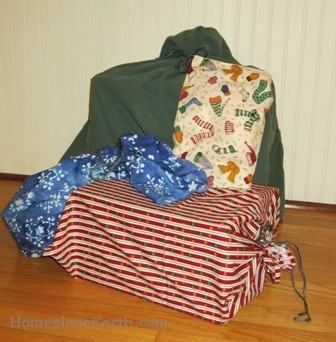 Sometimes I’ve wrapped large packages in an old flannel sheet, usually a red or green one. You might keep that in mind when picking out new sheets. Pillow cases work really well for gift bags, also. The year we were replacing the roof on the barn, we made tool boxes for each of our children from the old boards we took off the roof. Pillow cases were the perfect wrap. I even save the strings we use to close the bags from year to year. Life can be pretty stressful. So, as people go into the New Year they often begin thinking of how to live a more relaxed life. I have been reading an interesting book that can help with that. 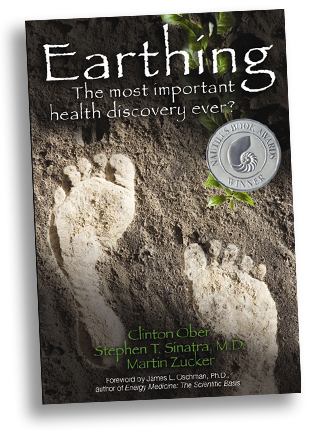 Earthing, by Clinton Ober, Stephen T. Sinatra, MD, and Martin Zucker explains how grounding ourselves fills our bodies with the unlimited supply of electrons from the earth that will connect with the free radicals floating around doing damage in our bodies. Those free radicals are why you always hear of needing to consume antioxidants. Although you can buy special earthing products to use, the authors make it clear that you can ground yourself just by walking barefoot on the ground outside. I have long known that being in my garden has a calming influence on me and communing with nature is widely known to be good for you. In the summer I don’t wear shoes if I don’t have to. I’ve found that by going barefoot I don’t track as much dirt in the house, but I didn’t realize just how good for me going barefoot was. I have to say, I haven’t been strolling barefoot in the garden since the weather turned colder. Walking barefoot on the beach or swimming in the ocean are also grounding activities. Apparently you could get the same grounding effect by having your feet on an uninsulated, unpainted concrete floor. If you have a basement with a concrete floor, you could ground yourself there in the winter. The grounding mats that are available for sale allow people to be grounded while they sleep, are at their desk, or just watching TV. People who have used them say they sleep better and pain is diminished or gone, doing away with inflammation that is the cause of so many diseases, including heart disease. Grounding thins the blood and sets your body up to heal itself. One thing I thought was particularly interesting was that you can avoid the stress of jet lag if, when you get to your destination, you take off your shoes and socks and spend ten minutes with your bare feet in the grass. All this is fascinating. Combine grounding with meditation and just think how healthy we can be! Meditation involves work on our part to discipline ourselves to it, but it is free and you can do it anywhere. Can you imagine doctors writing prescriptions for their patients to go sit in the grass and clear the chatter in their heads? I hope you have a wonderful holiday and terrific New Year. I’m taking a short break. My next blog post will be January 14. Until then—rethink everything! Wherever you garden, the climate determines how you go about it and what crops and which varieties you plant. Timber Press has set out to help you with the details by publishing guides specific to different areas of the country. 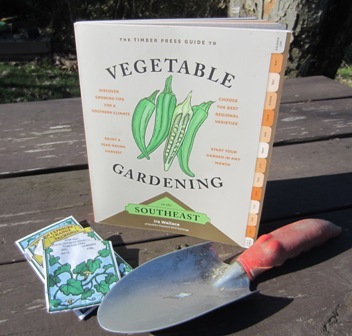 Ira Wallace has written their Timber Press Guide to Vegetable Gardening in the Southeast. Ira is the ideal person to write this book. Not only does she live in Virginia and is part of Southern Exposure Seed Exchange, but she has lived other places, including growing up in Florida. Southern Exposure is a seed company cooperatively owned by the members of Acorn Community. It serves customers across the U.S. and Canada, however it emphasizes varieties that perform well in the Mid-Atlantic and Southeast. To be more specific about what is included in the Southeast region of the U.S., Ira distinguishes between the Upper South and the Lower South. There is a map in the book showing which states are included in each designation. The Upper South has long hot summers where the temperature might reach 100˚, but not for long, with the nights being relatively cooler. The lows could reach to 0˚, but usually not below. The Lower South has long hot humid summers and shorter winters. Although in much of the U.S., gardeners welcome the summer heat, in the Lower South it can be a bit much and gardeners look to avoid the heat in August. The southernmost part of Florida where the temperature never goes below freezing is not included in this book. I’ve found that even though I’ve been gardening for many years, there is always something new to learn. Ira’s book is good for someone starting out new in vegetable gardening and for someone new to gardening in the southeast. It is also a good read for those of us who have been gardening in this region for a long time. She brought heat zones to my attention. I didn’t know that the American Horticultural Society publishes a Plant Heat Zone Map which divides the country into twelve zones indicating the average number of “Heat Days”. A Heat Day is one which reaches a temperature over 86˚. The amount of heat you are getting is important to consider in the southeast, particularly when, as Ira points out, pollen for tomatoes, bell peppers, lima beans, and snap beans is killed at temperatures above 95˚ and the stigma dries up. The plants recover when cool weather returns. I experienced that when I grew peppers in a small greenhouse, thinking that it would be a good thing. In the height of the summer they were not productive at all, however, once it cooled down they flourished. Phenology was another thing Ira covered that I’m not as well versed on as I’d like. Phenology is the study of recurring plant and animal life cycles and their relationship to weather. She has a list of some natural gardening signals taken from the records kept at Acorn and Twin Oaks Communities. Pam Dawling, author of Sustainable Market Farming, heads up the garden at Twin Oaks and has mentioned phenology in her book and in her blog. Long ago I had heard that the time to plant warm weather crops was when the lilacs were blooming (one of the signs on Ira’s list). We had lilacs so I thought I would pay attention that year. I started tomatoes in the window, as usual, but realized that I had another sign altogether that I could use. When the leaves became so big on the maple trees in the backyard that they shaded the window, it just happened to be the right time to plant out the tomatoes! From Ira’s book I discovered there is a National Phenological Network. Heat Days and phenology seem like good topics for future blogs, so stay tuned (but don’t hold your breath). Water is a recurring topic throughout the book and she suggests ways to increase water efficiency. There is an easy to understand description of why you would want to garden organically and suggested organic amendments. Ira strongly suggests you get your soil tested because if your pH is off, the nutrients won’t be available to your plants. I recently heard Clif Slade from Virginia State University say the same thing in a talk about his 43,560 Project. This book is about growing to eat out of your garden all year. After the Get Started section, there is a section devoted to each of the twelve months of the year, each with a to-do list. The third section is Edibles A to Z showcasing vegetables you might be growing in the southeast, complete with separate planting and harvesting charts for the Upper South and the Lower South. Those are general charts, however, and Ira encourages her readers to look to their local cooperative extension service and experienced gardeners in their areas for more specific dates. When to use floating row covers is mentioned in the crop descriptions. They are used for protection from both insects and frost. With so many varieties of each crop offered in seed catalogs, the suggestions in the book for varieties for this hot, humid region are helpful. Last year I welcomed Ira’s help to review varieties of staple crops that I listed on a regional chart for my Mother Earth News article Best Staple Crops for Building Food Self-Sufficiency. Of course, there are seed saving tips in this book. 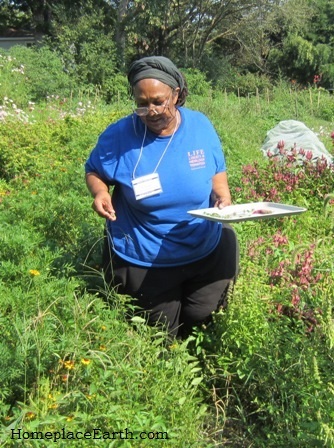 Seed saving is an important skill for gardeners to learn. If there is a gardener on your Christmas list, Ira’s book might be just the gift you need. The scheduled release date for Vegetable Gardening in the Southeast is December 11, however it is already available in Southern Exposure’s online catalog here. If you want to buy it directly from Ira, this is the place to do it, unless you find her at an event somewhere. She does get around. If you live somewhere outside the southeast, keep your eyes open for Timber Press guides for the other regions. The guide for the Pacific Northwest is already out and the ones for the Mountain States and the Northeast are due out in January. All are written by people knowledgeable about their region and all have the same format as Ira’s, with sections for Get Started, Month-to-Month, and Edibles A to Z. Embrace your regional climate with information just for you.